Raising Jack With Celiac : Raising Jack's 100th Blog Post Celebration and GIVEAWAY! Raising Jack's 100th Blog Post Celebration and GIVEAWAY! It's been 3 years since starting Raising Jack with Celiac and WOW, how time flies...have I really written 100 blog posts?? Well, yes, yes, I HAVE! I started this blog with hopes to help others on their journey with celiac disease, especially parents of children with celiac disease. I hope it's doing just that and I look forward to having this website for a very long time...I mean, Jack's only 6 yrs. old - I got a lot more raisin' to do! Since I've been blogging for 3 years, I've decided to have 3 GRAND PRIZE WINNERS! But, wait, there's more!! There will also be 4 ADDITIONAL WINNERS! Living Without Magazine is filled with TONS of resourceful information. I look forward to receiving every issue. I did a review on the Best Gluten-Free Cookbook - very pleased with it's contents and layout! They're soft, chewy and larger than your average fig newton. Pamela really has provided a new gluten-free treat that everyone will surely enjoy! 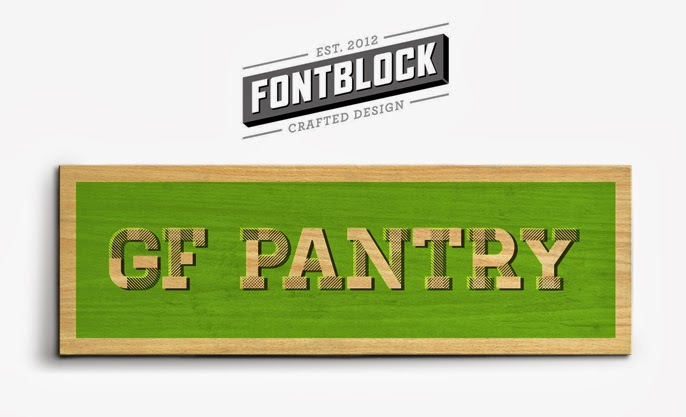 Lastly, a unique 24 x 5.5" hand-crafted masterpiece from FONTBLOCK - what's that you ask? It's an awesome, creative business that uses fresh-sawn hardwood along with clean typography to make cool decor - like the one below! To get more of an idea, make sure to visit their Facebook page. TOTAL OF 7 WINNERS TO CELEBRATE RAISING JACK'S 100TH BLOG POST! All you have to do is ENTER BELOW & you could be 1 of the 7 winners! Please know, that all winners are chosen randomly, through random.org. Thank you for participating and here's to the next 100 posts! GOOD LUCK and I hope to see you back here real soon. Giveaway ends Friday, March 21st at 12:00pm. THIS GIVEAWAY HAS ENDED. Thank you everyone for participating! WINNERS HAVE BEEN RANDOMLY SELECTED AND NOTIFIED BY EMAIL. I second that! Here's to the next 100 Posts! I appreciate, and thank you, for all of the information that you share so freely with us! I just love anything with figs !! !